If you're a fan of anime and you haven't heard of Miku Hatsune, then you've been living under a rock for the past few years. If you're not an anime fan and you haven't heard of her, than I can understand that... and I'm here to help. Miku Hatsune - sometimes referred to as Hatsune Miku due to the order of Japanese names: family name, followed by the given name - is a fictional pop star developed using Yamaha's "Vocaloid 2" voice synthesizer. In addition to creating the software, Yamaha also licences Vocaloid engines to developers to create their own voice synthesis softwares using voice actors. That's where Miku Hatsune comes in. 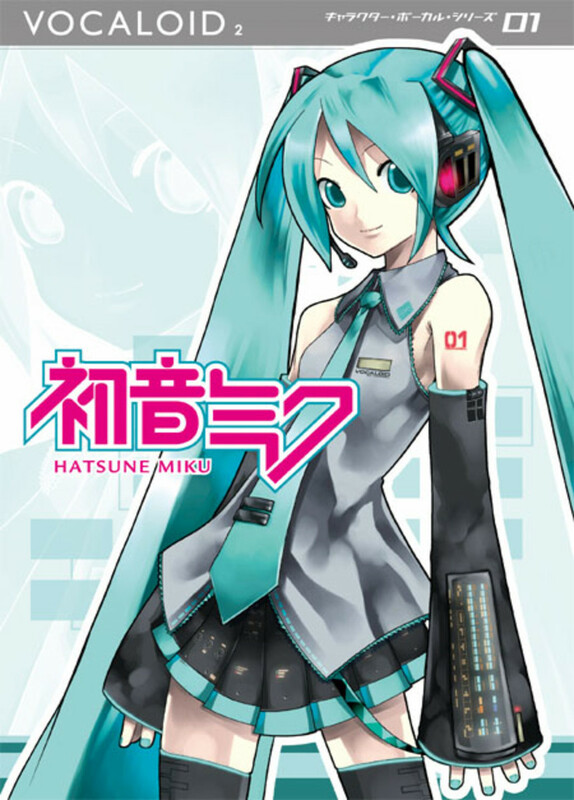 Crypton Future Media developed the Miku Hatsune software using the Vocaloid 2 engines and released it commercially to the public on August 31st 2007, as part of their "Character Vocal Series," using Japanese singer Saki Fujita for the voice. However, Crypton went one step further: since Yamaha leaves the bulk of Vocaloid marketing to developers, Crypton decided that not only did Miku need a stellar voice, but she needed to actually 'be' a pop idol to build up a marketable image in the same way idols do. Crypton started with a backstory, albeit a minimalist one, because they wanted software users to have some freedom to make whatever music they wanted. According to a representative of Crypton in a Japanese language interview "In the near future where songs are lost, an android was found who would communicate by singing." This android was Miku Hatsune. Her appearance had to heavily use the cyan (blue) color scheme, based on the color scheme for Yamaha synthesizers. Still - Just Who is Miku Hatsune? Not much is known about her, because Crypton didn't want to limit users by placing to many personality restraints on her. In promotional videos and Crypton/Yamaha "concerts" (in which Miku Hatsune performs as a projection - or more recently - as a 3D hologram) she appears cheerful, and very enthusiastic about her singing, probably because she comes from a world where songs have gone the way of the dodo, and she seems to be the only one in her time who has such a gift. All anyone - including Crypton representatives - know about her is that she is android who was found buried in the near future where the art of song has been lost, and that she communicates through song. She has a tattoo/print on her left arm reading 01 likely to signify that she was the first of Crypton's "Vocal Character Series." Her official Bio Puts her at 5'2" and 93 pounds, and Crypton recommends a dance or pop style when using her software, but if you go onto YouTube, you'll see several songs performed in many styles, from indie-rock to alternative - all in Japanese. This has allowed fans to and musicians near freedom to utilize her in almost any way possible. While there are English versions of Vocaloid 2 engines, So far, Miku Hatsune is only available in Japanese, but Crypton has confirmed plans to develop an English version of Miku Hatsune, but no release date has been set at the time of this writing. The western world is not an unfamiliar land for Miku: she performed a concert at the staples center as part of Anime Expo earlier this year. Additionally, Three figurines featuring a Hatsune-based character (called "Hachune Miku") were launched from a rocket out of Nevada in 2009. She was also featured in an issue of U.K. music magazine Clash, with a cosplayer (costume player) dressed as her on the cover, and a full feature inside. Miku Hatsune fans also have their own little nickname: We call ourselves "Mikutards." Here is a video of one of Miku's hologram concerts. She is performing the song "The World is Mine" by with the band Supercell. This video is in HD format, so it may take a while to load. They are awesome! I just like Miku's live shows more myself still, though.